Just talk. Voice-controlled calls. Multiple functions can be voice controlled for hands-free use. All-day conversations. Over 24 hours of talk time. "What can I say?" "Check battery" "Am I connected?" "Redial" "Call back" "Pair mode"
Advanced Audio Distribution (A2DP) v1.3.1, hands-free profile v1.7, headset profile v1.2, phone book access profile (PBAB) v1.1. Can I use the BlueParrott B550-XT with my smartphone and tablet/PC? 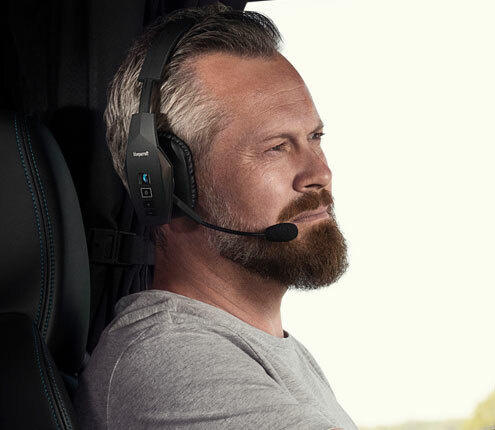 Yes, this headset uses Bluetooth connectivity and can be paired to any compatible Bluetooth® device. The battery has more than 24 hours talk time. Low battery is indicated on the product when the MFB (multi-function button) flashes red twice. When the MFB button is blue, there is more than 24 hours battery. There is also 400 hours standby time, when you are not using your headset. Yes. The BlueParrott B550-XT has A2DP (Advanced Audio Distribution Profile) capabilities which allow for streaming audio other than call audio, e.g. music or GPS directions. Can I pair this product with iPhone and Android? Yes. The first time you turn on your BlueParrott B550-XT, it is ready to pair with your mobile phone via Bluetooth or NFC (One-Touch pairing for Android only). See the user guide for more details. Yes. It works with both if your PC or Mac has Bluetooth® audio enabled. Please refer to your PC/Mac manufacturer specifications to ensure this is supported before attempting to pair the B550-XT. Does the charging cable come with the headset? Yes, it is supplied within the pack for the BlueParrott B550-XT. You can use the USB cord provided in the box to connect to the adapter or auto charger. How long does it take to fully charge the headset? A fully discharged battery will need approximately 3.5 hours to achieve a complete charge. What is the wireless range from my mobile device? You will get up to 300ft / 100 meters of wireless range from your mobile device whilst on a softphone call or listening to music, providing there is a clear pathway between devices.